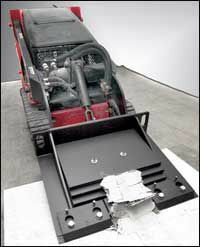 The 3500 XLT Floor Scraper skid steer floor-scraper attachment is suited for economical removal of vinyl composite tile (VCT) and floor covering. The durable carbide ceramic tile scraper tips remove even the most well-bonded quarry tile, porcelain tile and pavers and ceramic tile. The long-lasting floor scraper blades with high carbon content hold an edge and break less frequently and are configured in flat, self-dicing or carpet-removal styles to remove wood flooring, carpet and adhesive, linoleum sheet goods, elastomeric and waterproof membranes, and floor-leveling underlayment. Thicker blades are available for epoxy and hard floor-covering removal. With the 3500 XLT Floor Scraper attachment, floor-covering removal by a single operator is available nationwide as the attachment can be shipped rapidly and the skid steer power plant rented locally. Clean-up of removed floor covering can be performed quickly by detaching the scraper head and attaching a standard bucket. With the 3500 XLT Floor Scraper attachment, one man can replace the large crews generally required for interior demolition and tenant improvement projects. With a minimal workforce, the risk of injury is nearly eliminated, worker’s compensation liability is greatly reduced and getting a job completed in time is more predictable. This one-person operation is quick and easy, with the average time of less than a minute for a blade change and less than two minutes to change from scraper to bucket. With the use of the high-torque progressive downforce delivered by the skid steer host unit, the 3500 XLT scraper blade remains under the product being removed for high production removal. 3500 Super Scraper Attachment attaches to skid steers (over 10,000 for rent across the U.S.) removes up to sq. 3,000 sq. ft. of vinyl tile per hour. Attaches to propane or battery forklifts for zero emissions operational. Ideal for factory routine floor maintenance and clean up with no floor gouging.